African futures, travelling diasporic sounds and writing by Africans for Africans are at the core of the Chimurenga Library exhibition on show until the 21st of November at The Showroom in London. Chimurenga, whose name comes from a Shona word referring to the ‘struggle for freedom,’ is a Pan-African publication of writing, art and politics. Ntone Edjabe, originally from Cameroon, started the internationally acclaimed platform based in Cape Town, South Africa in March 2002. Influenced by Fela Kuti’s, ‘Who no know go know’, Chimurenga lets its audiences in on what’s happening on the continent. The multidimensional platform’s publications include a quarterly Pan-African gazette titled The Chronic, a visually attractive journal that centres culture, arts and politics and features an incredibly sharp range of contributors, including Binyavanga Wainaina, Paula Akugizibwe, Lesego Ramolokeng, Kodwo Eshun and Chimamanda Ngozi Adichie. With the Pan African Space Station (PASS), Edjabe offers a periodic, pop-up live studio that functions as an exhibition space as well as a living archive. Through these and other innovative initiatives, Chimurenga provides a much-needed political platform through word, sound and new spaces. Chimurenga Library, presented by The Showroom and The Otolith Group, has taken over The Showroom gallery by transforming the existing space and structures into a place for friends and interested folks to come together and hear live broadcasts and music, transcending the limitations that gallery walls pose to the viewer. With taped routes linking ideas with people, writing, research, music, a variety of films, photography and an actual library, the exhibition reflects Chimurenga’s position as a leading Pan-African cultural platform. Preview of The Chimurenga Library, 2015. Photo: Dan Weill. Courtesy Chimurenga, The Otolith Collective and The Showroom. The Chimurenga Library allows participants to join in and be part of the creation of an archive that is deeply rooted in Pan-African knowledge systems and connections. For instance, the routes and cartographies in the gallery demonstrate Chimurenga’s vision of realities and imaginaries created by Africans for Africans. This refreshing and necessary approach is exemplified in one of The Chronic editions, New Cartographies, which subverts the use of cartography as a technique of empire by exploring what happens when Africans make maps for their own use. This subversion of colonial knowledge systems through the creation and imagining of African futures underlies Chimurenga’s vision. During the first week of Chimurenga Library, the PASS live stream, featuring journalists, curators, musicians and writers, was recorded and forms part of the existing exhibition. The Showroom gallery now houses a participatory archive that functions as an active site shaped by many narratives and sounds. Chimurenga also works with a range of UK based collaborators, including the London based collective Sorryyoufeeluncomfortable. Building active transnational archives that connect Cape Town to London to Lagos are important for the ways in which sounds and rhythms travel and follow us. The existence of PASS raises important questions regarding space and location. This living archive can be seen as a third space, as it is not limited by singular locations or made geographies. This also shifts fixed ideas about where Africa is, where knowledge production takes place and how a shared listening experience advances. London is an important temporary home for the Chimurenga Library. Many South Africans in exile made their way to the city during Apartheid; Cape Town based photographer George Hallett’s work is testament to that. Hallett, who lived in both London and Amsterdam, documented many South African jazz musicians in exile. The exhibition features his beautiful images of Chris McGregor, Louis Moholo, Dudu Pukwana and Johnny Dyani, who were part of Brotherhood of Breath. Their earlier band The Blue Notes, which also included Mongezi Feza and Nikele Moyake, tells an important story about the travels of political sound. After leaving South Africa, the musical tradition continued in Europe and became an important element of the experiences of South Africans in exile. Cities such as London, Amsterdam, and Paris share important histories and legacies, as cultural centres that were greatly influenced by the Black diaspora. For other South Africans living in Europe, these living legacies offered a way to connect and to create homes within foreign cities. I clearly recall the buzz around these South African artists playing at the Bimhuis in Amsterdam, my hometown, and experienced how the meaning of jazz in exile became an integral part of growing up outside of South Africa. Hallett’s work documents an important part of the reality of exile narratives. These images bring together a deep passion and need for connection through music, brotherhood and everyday Black life. In a short documentary, Louis Moholo reflects on the music and friendships he had with his band members in exile. The sadness of many members passing away and not making it back to South Africa is palpable. Chimurenga shows through these and other interventions on artistic and cultural expression how important it is to sit with the historical commonalities. Instead of seeing this as a past history, Chimurenga actively engages in rethinking how these accounts form part of our collective consciousness today. Towards that same effect, Curator Christine Eyene, who has worked with Hallett for years, connects his portraits with African writers and the diaspora in her research, which forms part of the Making Histories Visible project at the University of Central Lancashire. Eyene was amongst the many participants of the PASS talks at the gallery. Generally, there is still too little focus on South African women in exile. Women such as Busi Mhlongo, who also lived and performed in the Netherlands, also form an important part of this conversation. The aim to trace and follow artists through different African and diasporic worlds makes Chimurenga stand out. There is a real commitment to following through conversations via multiple platforms. Recently the London based jazz musician and composer Shabaka Hutchings presented what could be called a musical essay at The Showroom. Hutching performed for PASS multiple times, and this time around presented one of his newer compositions inspired by the Black American writer Octavia Butler. 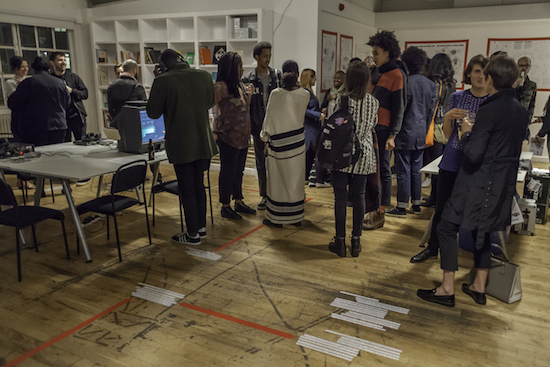 Chimurenga forms part of an important conversation on Afrofuturism not only by engaging with artists such as Hutchings, but also by organising on and offline get-togethers where participants explore how African futures might be envisioned. 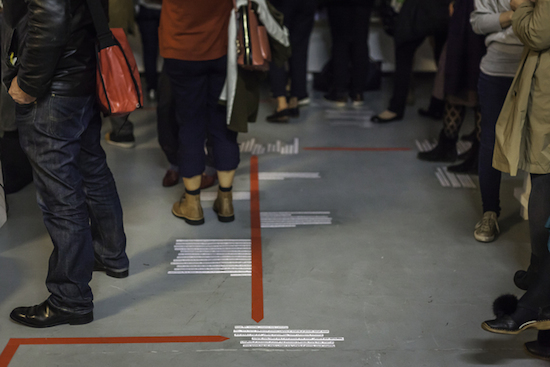 Online conversations such as the Circum-Atlantic Conference: The Future of the African Diaspora brought together speakers in Johannesburg, Sao Paulo and New York, which are among the many spaces Chimurenga will soon hold a temporary presence. Feature image: Wall text at The Chimurenga Library, courtesy of the author. Chandra Frank is an independent curator, writer and PhD Candidate at Goldsmiths College in London. She is interested in feminism, race, heritage, resistance and the role of the archive.